Will G: I have a 96 Ford F150 with a 5.0 liter engine and in park or neutral the idle wants to climb to almost 2000 rpm. I took a look at the throttle plates and they are nasty/heavy carbon looking. When in Drive/Reverse idle is around 700 rpm or so. I’m guessing dirty throttle body and/or IAC? Sparky: Anything is possible but normally dirty throttle bodies and throttle plates result in a low idle. My thoughts would be a vacuum leak, sticking IAC (tapping on it will sometimes break it free) or erroneous data that is causing the computer to command a higher idle. Will G: I went ahead and cleaned the throttle body and IAC with no luck. Blocked the IAC by putting a piece of soda can between the IAC and throttle body. It would barely run which to me indicates no vacuum leaks after the TB. Removed the piece of soda can and the high idle is still there. It was running fine the other day. Sparky: Disconnect the two wire harness to the IAC and see if the idle drops. If it does the computer is commanding it open and further diagnosis is needed. If it does not drop the IAC is stuck and needs to be replaced. Will G: Ruled out IAC by unplugging IAC while running and the idle will slow down and it will die. Throttle plates are fully shut by visual inspection. When I first bought the truck last year it was throwing bank 1 and 2 too lean which was a combination of exhaust leaks and dirty MAF. Local garage smoked intake for vacuum leaks and checked fuel pressure. No vacuum leaks and fuel pressure was OK. Garage repaired exhaust leaks and cleaned MAF. No CEL and no driveability issues other than the high idle when in Park and Neutral. Borrowed an OTC Genisys scan tool and verified that the ECT and IAT sensors are reading properly. My thought is a faulty TPS as the TPS mode reads PT and not closed when it’s at dead idle. Sparky: It would seem you are on the right track. 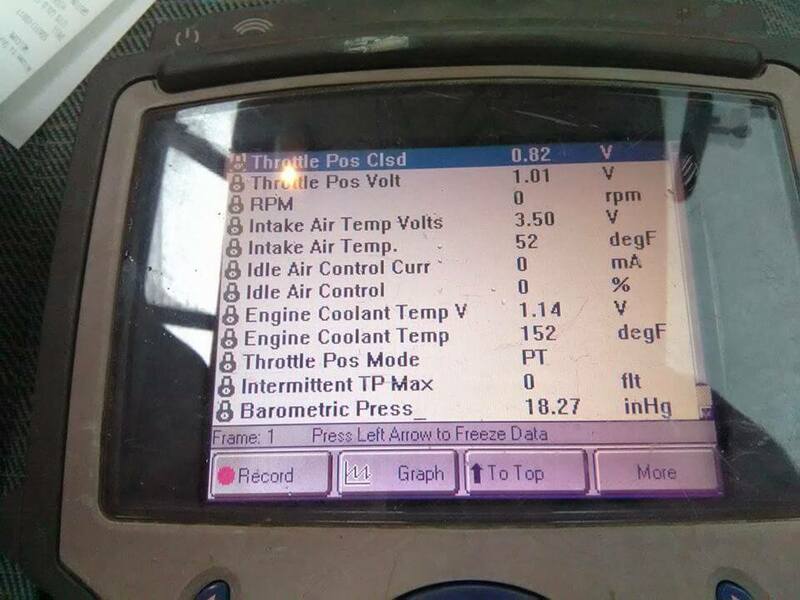 If it were in my shop I would connect a sensor simulator to confirm the diagnosis. Check to make sure there is no play in the throttle shaft that could account for the slightly high voltage and the PT reading. Also check the base idle screw to make sure it has not been adjusted. If nothing is found try doing a KAM reset with the scan tool and see what happens. Also wanted you to confirm how many pictures you uploaded. Will G: The throttle shaft is tight. I have not messed with the base idle screw and it is tight. I uploaded 2 pictures. I’ll throw the scan tool on it before I head over to my buddies place tomorrow and monitor the ECT IAT and fuel trims. Will G: Went over to my buddy’s and we checked for vacuum leaks and found none, O2 sensors are switching and it is going into closed loop. Reset the KAM and still idling high. 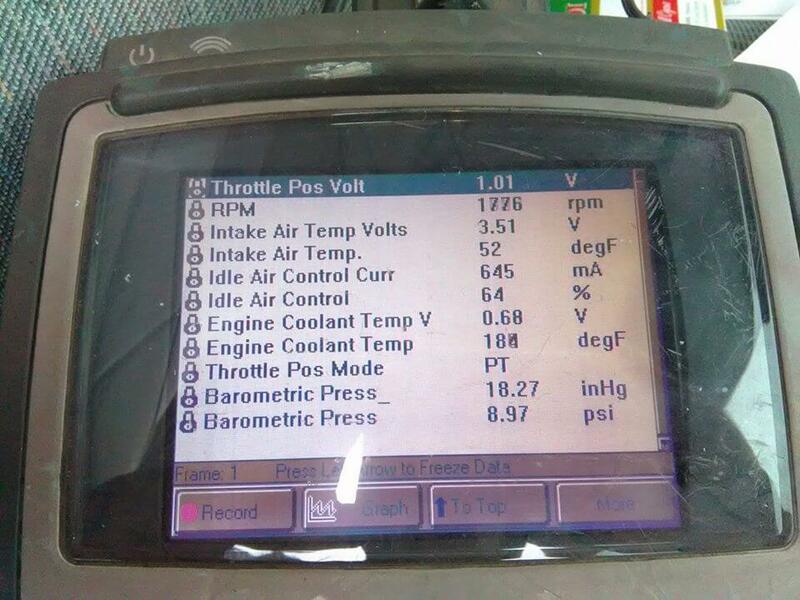 At idle the TPS reads 20% and the factory spec at idle is 0-15% which confirms my suspicion of a faulty TPS. Will G: I have ordered a new Motorcraft sensor, throttle body gasket, and throttle body coolant hoses. I’ll let you know how I make out. Getting back together with my buddy next Sunday to replace the sensor and confirm the repair. Will G: Got together today with my buddy and we replaced the TPS and all is well. 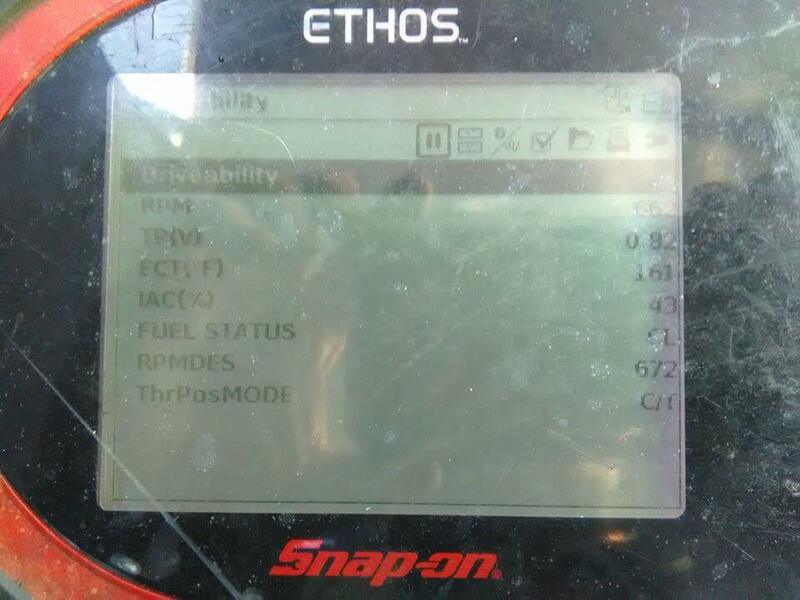 Hooked up his Snap On Ethos and the TPS voltage at dead idle is now 0.82 v and the throttle position mode at dead idle is now C/T. Sparky: Glad everything worked out and your truck is fixed.